Just a quick post today. 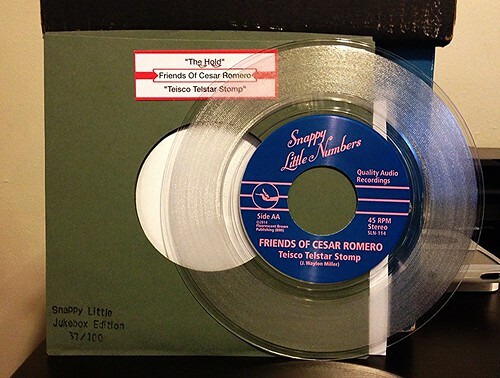 If you want the full scoop on how great the music on this 7" is, just read yesterday's review here: http://www.ibuywaytoomanyrecords.com/2014/07/friends-of-cesar-romero-hold-7.html Needless to say it's great. Today's picture is of the limited to 100, clear vinyl, Snappy Little Jukebox edition of the record. Sure it's a simple little variant, but I just love it. It's numbered, you've got colored vinyl and I'm just an absolute sucker for those little jukebox tags. You can probably blame the Jon Spencer Blues Explosion Jukebox Series for that.